Ukrainian mass media has repeatedly touched upon the subject of the possible possession of 2S4 “Tyulpan” 240 mm self-propelled mortars in Donbas by the “separatists” (or, to call a spade a spade, Russian military and their accomplices); however, so far there have been no visual confirmations of this. The media wrote about the use of Tyulpans during the assault of the Luhansk airport and later Donetsk airport. 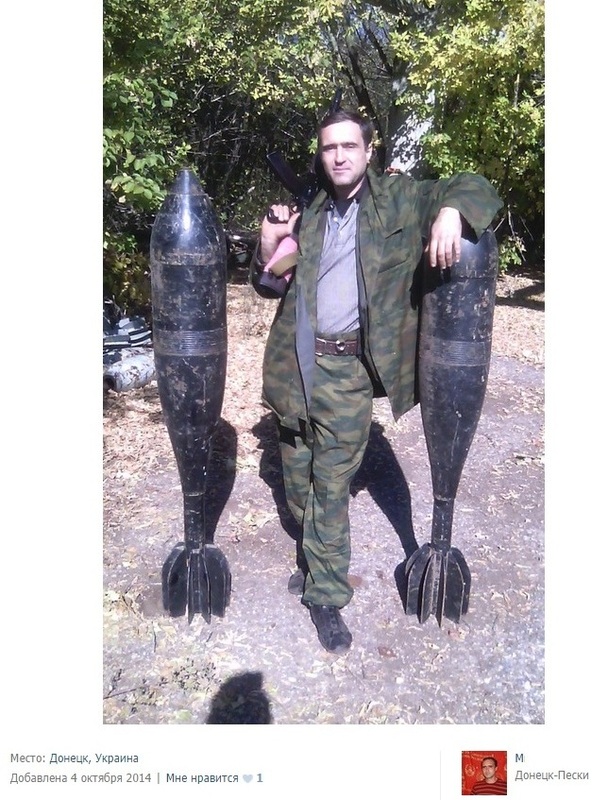 They were also mentioned by the coordinator of the “InformNapalm” team Roman Burko on October 13 (recall that Tyulpans were seen in Donetsk in September and one of them was reported to be destroyed by militants themselves). However, many people questioned the likelihood of these events. Now we would like to present the evidence that “separatists” do have 2S4 “Tyulpan” mortars. 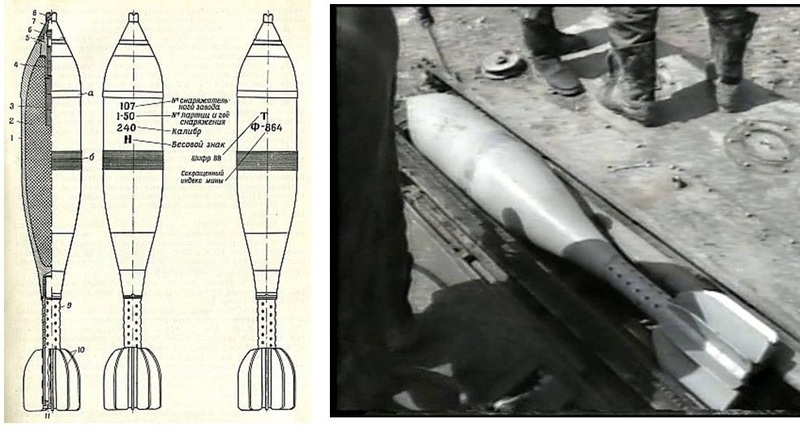 In the photo below you can see 53-F-864 HE (high explosive) rounds used by 2S4 “Tyulpan”. 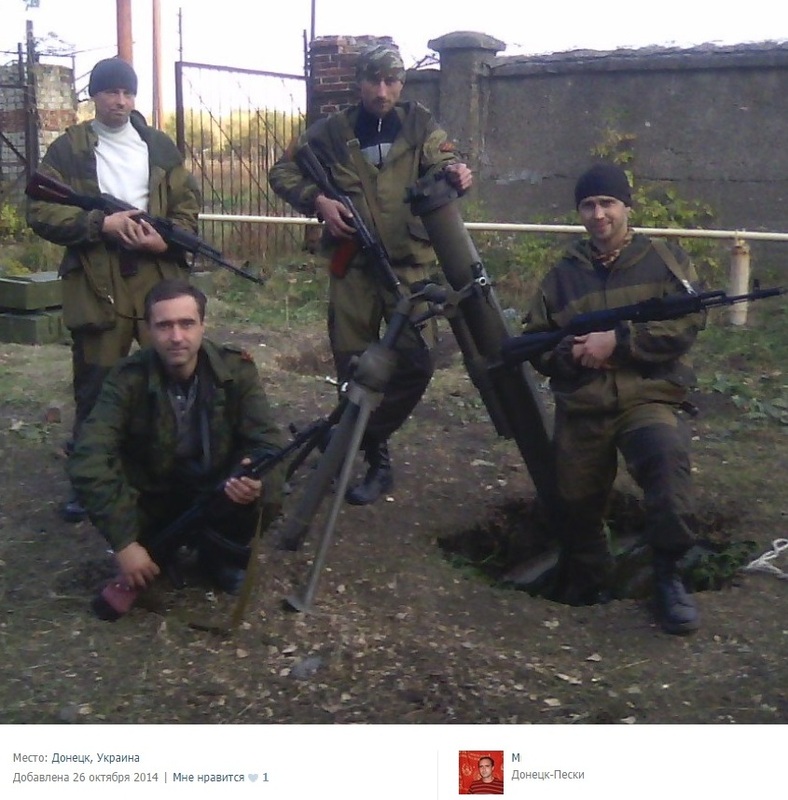 In the photograph (1) with mortars for “Tyulpan” and photograph (2) with a mortar of a smaller caliber, you can see a militant from Abkhazia (territory of Georgia currently occupied by Russian forces). These mercenaries from Abkhazia are actively involved in terrorist activity in Donbas operating under Russian Special Services. Q: Where is the mortar itself? A: We do not have a photograph of the motor tube itself. However rounds like those weigh over 130 kg and obviously cannot be shot from a sling. The presence of ammunition assumes the availability of a mortar to fire the ammunition. Q: Why are mortars black and look like museum pieces? A: The armament, just like its ammunition, is quite ancient. It is quite possible that the mortars above are drill ammunition rounds, but if you look closer at the first photo, you will see the tail fins of a standard gray mortar round. 2S4 “Tyulpan” self-propelled mortars and their ammunition is the armament of the Artillery Reserve of the High Command of the Armed Forces of the Russian Federation. 410 units are in storage, other 20 units are distributed across several military units, including the 8th Separate Self-Propelled Division, military unit 64493, Tambov. In the third photo you can see a 53-F-864 round for 2S4 “Tyulpan”. Ukraine Freedom Support Act. You can help stop the war in Ukraine! OSCE observer is wounded from counter-fire while observing separatist militia firing a mortar at Ukrainian forces. The Tour of Duty of the 200th Special Purpose Separate Motor Rifle Brigade of the Northern Fleet of the Russian Navy in Rostov Region and in Ukraine. News of Deployment the 5th Tank Brigade of the Russian Eastern Military District to the Ukrainian border. Mind and analytics: How much Russian activity does it take before the OSCE notice? Russische Militärtechnik: „Leopard“ und „Drache“ sind bereits in der Ukraine. A.Piontkowski: Putin kann kein Schach spielen, darum spielt er Poker. INFORMATION : NOTRE SITE DÉMÉNAGE ! Dix boéviks morts et un représentant de l’OSCE blessé dans des circonstances bizarres. Tchétchénie s’embrase : comment la Russie s’est tirée une balle dans le pied. © BurkoNews.info When reprinting, active hyperlink to the source is required.